CreditCards.com reported that the national average APR for new card offers has stayed at level near record highs, according to the the website’s Weekly Credit Card Rate Report. The 15.79% percentage is an average of 100 of the most popular credit card products in the United States. The list includes credit cards from dozens of leading issuers and represent every card category. Introductory rates are not included in the calculation. The national average percentage remained at 15.79% for the second week in a row. Earlier this May month, the average APR hit an all-time high of 15.80%. 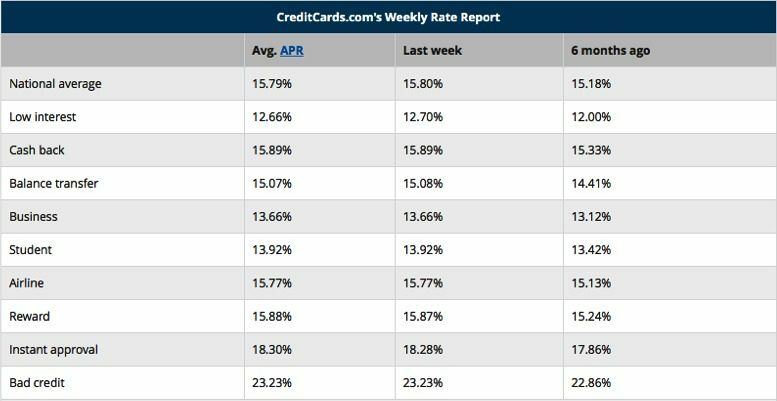 Most credit card issuers have left interest rates unchanged this week. U.S. Bank increased the maximum APR on the U.S. Bank Business Edge Cash Rewards card from 18.74% to 23.74%. However, the change didn’t affect the national average because the CreditCards.com website takes into consideration a credit card product’s lowest available interest rate when calculating the average ones. U.S. Bank left the Business Edge Cash card’s minimum APR of 12.74%unchanged. None of the card issuers made any structural changes in the promotional terms this week. This include the zero percent balance transfer offers and introductory purchase rates. Pentagon Federal Credit Union tried to encourage consumers by cutting the minimum APR on the PenFed Promise Visa from 10.74% to 9.24%. This is the second time in May when PenFed has revised rates on the Promise card. Last week, it increased the card’s minimum APR from 8.99%. American Express also changed its rates this week. AMEX increased the maximum APR on the Blue Cash Everyday card from 23.74% to 24.74%. The competition for new cardholders is increasing and this makes the credit card issuers to improve their reward packages by offering an unprecedented benefits to new credit card holders who would agree to pay a sizable annual fee. American Express for example has added a many new benefits to the American Express Platinum card after it’s annual fee was increased to $550. The Platinum cardholders are now eligible to receive up to $200 on Uber credits per year and will earn a higher bonus on flights and hotel purchases booked through American Express website. Chase has announced that new and current Sapphire Card cardholders who get approved for a mortgage with Chase Bank will receive 100,000 reward points as bonus. According to Chase, All Sapphire cardholders will be able to take advantage of this bonus that worths up to $1,500, including Chase Sapphire Reserve and Chase Sapphire Preferred cardholders. The premium cards are becoming more popular, which makes more credit card issuers are to enter the premium card market by adding significant benefits to their credit card products. U.S. Bank recently introduced a super premium card called the Altitude Reserve Visa Infinite card that gives huge bonus on mobile purchases and provides the new cardholders with generous travel credits and other benefits. Card issuers are also trying to lure new customers with high credit lines. A research from TransUnion credit agency shows that, the average credit limit for credit card holders with the highest credit scores has increased by nearly $4,200 since 2010.